Critical Link, LLC, experts in image sensor integration, system-on-chip (SoC) and field-programmable gate array (FPGA) designs, vision protocols, and signal processing, introduces the MitySOM-A10S-DSC processor board for the next generation of embedded imaging applications. The new board features dual-side connectors for stack-through configurations. 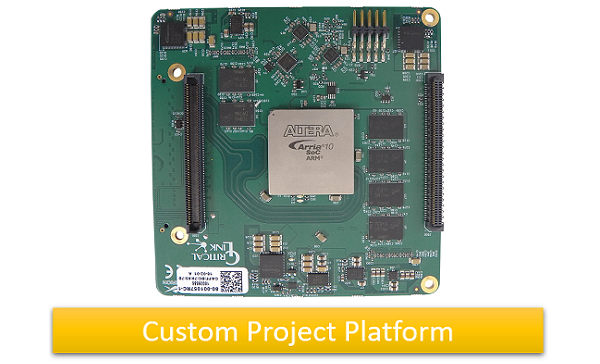 It is a highly-configurable system-on-module (SoM) featuring the Intel®/Altera Arria®10 SoC with dual core ARM and up to 480KLE FPGA fabric. The module includes on-board power supplies, two DDR4 RAM memory subsystems, and a rich set of user interfaces. This entry was posted on Wednesday, January 23rd, 2019 at 3:55 pm and is filed under Advertiser, News.